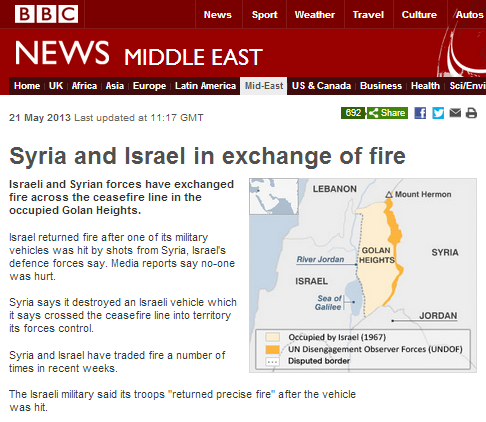 An article entitled “Syria and Israel in exchange of fire” appeared on the Middle East page of the BBC News website on May 21st2013. If readers of the article were expecting to find out what actually happened in this latest incident, they would be disappointed. The report presents the story in terms of conflicting claims – and yet again undiluted Syrian regime propaganda is presented to readers without any effort having been made on the part of the BBC to verify its claims. Neither the headline nor the leading paragraph makes the chronology of events clear. Only in the second paragraph do readers learn that the Israeli fire was a response to Syrian actions. However, what this report does not state is that the attack which prompted the Israeli response was in fact the third such incident of cross-border shooting in the same location in three consecutive days. “IDF Spokesperson’s Unit reported Tuesday that gunfire from Syria hit an IDF unit in the Golan Heights, as had occurred on the two previous nights. No injuries were reported, but a patrol jeep was damaged. The IDF retaliated by firing a Tamuz missile that destroyed the post from which the shots were fired. The BBC report, however, omits the fact that repeated shootings took place at the same location and depersonalises their targets. What the BBC terms “sporadic exchanges of fire” are in fact twelve recorded incidents in the past three months: an average of one a week. “A statement from the Syrian army said it had “destroyed an Israeli vehicle with everything that it had in it”. The statement said the vehicle was shot after it crossed the ceasefire line and headed towards the rebel-held village of Bir Ajam. There is, of course, no evidence to back up those claims. The three consecutive bouts of gunfire were shot at Israeli soldiers travelling in a vehicle carrying out a routine patrol (which would be familiar to the Syrian army units in the area) along the Israeli side of the border fence. The fact that the BBC uncritically parrots the Syrian propaganda to its readers without making any attempt to confirm the accuracy of its claims does not represent impartiality, but a failure to meet BBC editorial standards of accuracy. Also interesting is the fact that the BBC report fails to point out to readers the significance of this official Syrian claim of responsibility for the cross border attack – the first time such an admission has been made since the beginning of the civil war in Syria. In order for that sentence to be accurate, its last part would have to read “and Israel has on some occasions returned fire” and its first part would refrain from the use of the word “positions” – which suggests exclusively military targets – whereas in fact a significant proportion of the mortar shells fired from Syria have been directed towards civilian communities. a) Provide international news broadcasting of the highest quality. b) Enable individuals to participate in the global debate on significant international issues. The blind promotion of the propaganda of a ruthless dictatorship without any effort being made to verify its claims, and without any attempt to engage in critical thinking, does not serve the purpose of building “understanding of international issues” – quite the opposite in fact. If BBC audiences are interested in reading the Assad regime’s propaganda, they can do so on its official state news websites. From the BBC, licence fee payers expect journalism which will help them look beyond that propaganda.